From the realms of fantasy to your hands! 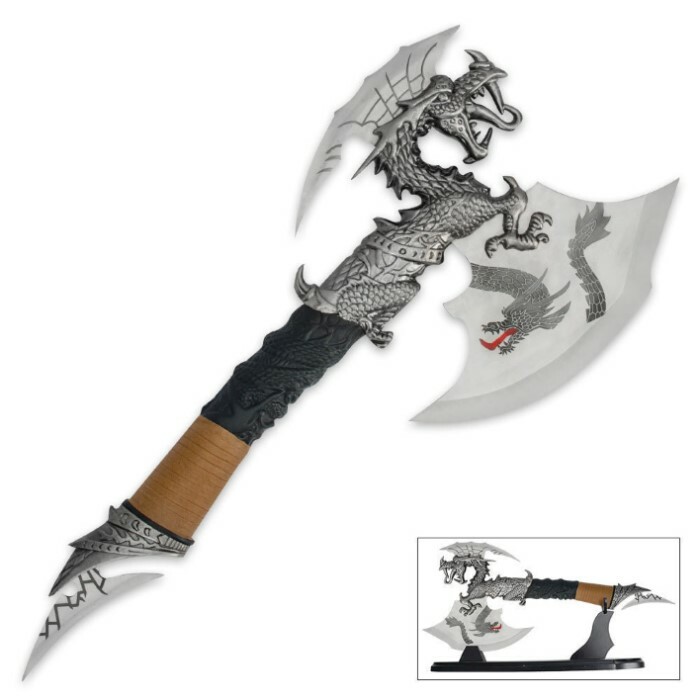 Our Tri-Blade Dragon Fantasy Axe features three stainless steel blades, each adorned with screen printed accents. A rubber and faux leather wrapped grip complete this piece. A wooden display stand is also included. This is by far my most aesthetically pleasing weapon. This is a short axe with really cool looking dragon designs. It has a nice weight to it with a comfortable rubber handle. It's not as sharp as I would like but overall this is a fantastic piece. this axe is so dang awesome!!!!!!!!!!!!!!!!!!!!!!!!!!!!!!!!!! My son collects anything dragon and when I saw this in the catalog I knew he would love it.It was delivered today and he was surprised and he thinks it is beautiful. It does look really great and fits in perfectly with his collection. It is very substantial and could be used as a weapon in an emergency. I always know that any product that we receive from BUDK will be of good quality. Dragon Fantasy Axe with Stand This item more than surpassed my expectations. A well made Fantasy Axe. It is a quality made display Axe. Solid enough that it could be used as weapon in an emergency.